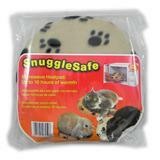 CAUTION The Snuggle Safe contains a product called Thermapol which according to the manufacturer is non-toxic and harmless when used according to directions. If seriously overheated, the bottle is designed to melt down so that the Thermapol disperses without impact. If leakage occurs as a result of overheating the Thermapol will be dangerously hot. DO NOT TOUCH. Allow the Thermapol to cool. When cool it can be removed from hard surfaces with hot water.